The card is only provided to Vietnamese citizens who have an ID card or a foreigner from 18 years old or older who has a passport. The program does not apply to employees of Aeon Vietnam Limited Company. Customers will receive a free Aeon Membership Card and a small Key Card (equal value to a large card) after Aeon Card registration. Each customer owns only one (01) card number code. In case of losing your card, please contact our Customer Service Desk to get a new card with a fee of 20,000 VND. 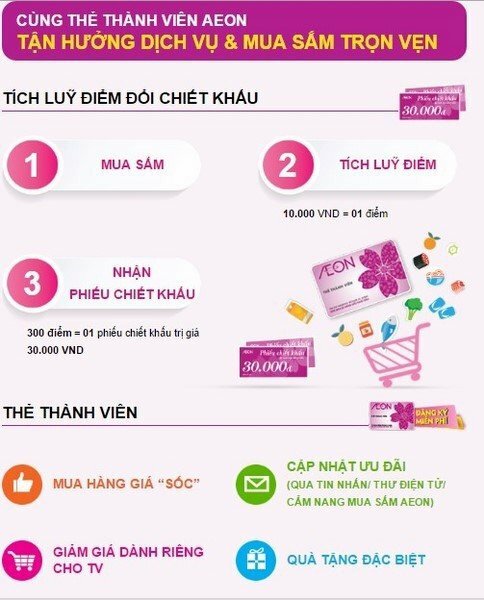 For every 10,000 VND spent at Aeon Department Store and Supermarket, customers accumulated one point. For every 300 points, customers receive one (01) Aeon discount voucher worth 30,000 VND. Accumulated points cannot be converted into cash. Points accumulation does not apply to Discount Coupons, Aeon Coupons, or when shopping at the Business Center or Eating Area. On the Member's Day (5th and 20th of each month), members will receive a discount of 5% on most items except processed food, some items at Aeon Wellness, Daiso, Cigarettes, formula milk for children from 0 to 24 months and some other items. Accumulated points not exchanged into discount vouchers in the preceding year will be automatically converted into accumulated points of the following year and only converted into discount vouchers until June 30 of the following year. Show your Aeon Member Card and ID card / Passport (if needed) for payment, voucher exchange, gift exchange, or related procedures. Points and profile information will be updated officially 24 hours after the transaction. The accumulation of points after purchase only applies to bills within 3 days of printing on the bills. Aeon reserves the right to decide at any time whether to amend or terminate the Aeon Card Membership without prior notice. Aeon is not responsible for handling the benefits of the customers if the information provided by the customers is incomplete or inaccurate, or if the time limit for receiving benefits is not specified in the program. Aeon is allowed to use the information contained in the registration form and all shopping related data of Aeon members to support direct marketing activities, statistics and program management. All data relating to the members will be kept confidential. For any inquiries, please contact our Customer Service or email theaeon@aeon.com.vn.